When Marie McGee explored this area in her Millersburg Glass - As I Know It, we can only guess at just how many areas of controversy she explained away when covering the subject! Earlier writers probably had not observed as many examples and could not be so specific in their explanation. By the time collectors arrived in the 1995 timeframe, selective and identifying names had become more important. Marie herself concentrated on Millersburg Glass and studied it for some years before purchasing any of it, she once told us. 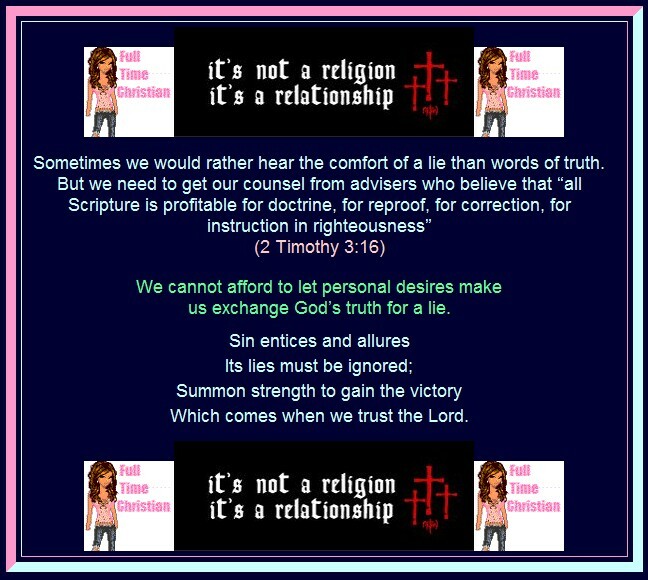 This is a complicated area and we confess that it has taken some years on our part to be in the right place at the right time, in order to accumulate photos of the examples you see here. Dare we repeat this another time? Not such an easy task as finding Peacocks and Good Lucks! (smile) Collecting nice examples of these four “specialized” designs requires effort. With your indulgence, we approach an area of discussion which should simplify the confusion over Millersburg berry wreath patterns. A feature found in each of the Grape Wreath, Grape Wreath Variant, and the Strawberry Wreath is the square-shaped wreath composed of leaves and tendrils with berries extending toward the center in all sizes or shapes of these berry patterns. All the wreath patterns have the Wide Panel exterior pattern. In all likelihood, Strawberry Wreath molds were created first. Other than the center bead of glass, no center design exists. 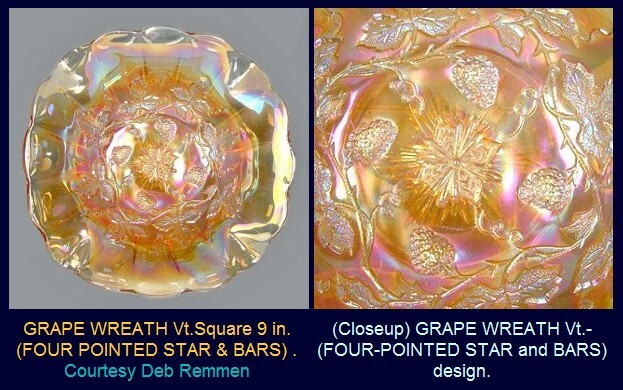 At some later point in time, those same molds were probably retooled, using the “Jewelers Bead” in center as the focal point for the four variations found on Grape Wreath and Grape Wreath Variant pieces. Blackberry Wreath and Blackberry Wreath Variant also utilize this same square-shaped wreath in all sizes or shapes of those berry patterns. We will cover those designs in a coming segment. 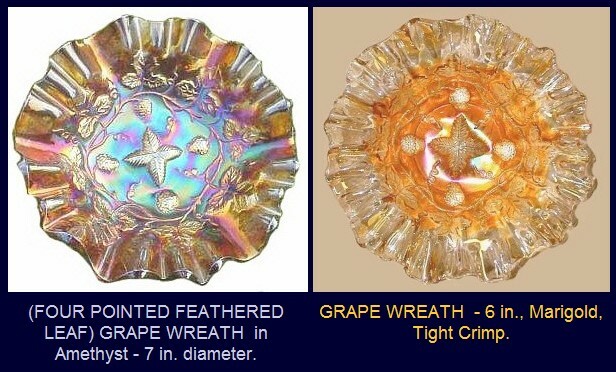 The marketing strategy used by John W. Fenton in convincing the buying public that strawberries could also be seen as grapes is unparalleled in the history of carnival glass design. He would have made a very good modern-day politician! On the other hand, perhaps that sort of “logic” contributed to the early Millersburg demise? We shall never know the answer to that one. These identifying marks should provide ease and pleasure in your search for these lovely examples of Millersburg. Information and education are keys to great collecting. 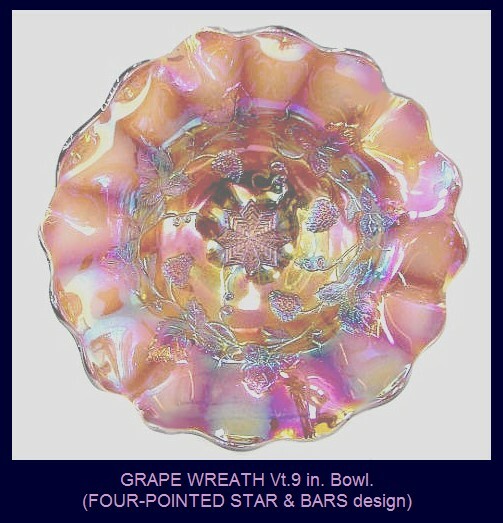 GRAPE WREATH: The four-pointed feathered leaf designates the center design in Grape Wreath bowls. 6” and 8” bowls having ruffled or candy ribbon edges, along with ice cream shapes are known. Small sauce dishes and 6” tri-cornered pieces command higher prices when rarely seen. Deep berry bowls and a large ice cream shape are rarely seen. Colors: amethyst, green and marigold in both radium and satin finish. GRAPE WREATH VT., Clover and Feather: Not easily found. However this ice cream shape amethyst one is a super example! GRAPE WREATH VT., Eight-point Star: This spider web effect design is seen more often than either of the other two variant designs. The “strike” on this pretty green example is quite pleasing. GRAPE WREATH VT.,Four-pointed Star and Bars: Much like a stylized sunburst, this is the most elusive of the three designs. The lovely radium example shown here is certainly a glowing example of finest quality! The square shape of the bowl is a plus for collectors. Ice cream shapes are always desirable and certainly this amethyst example displays the pattern most adequately. 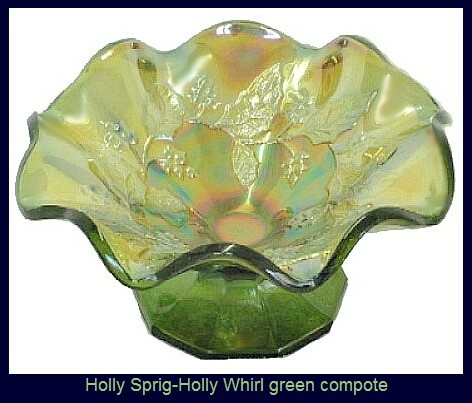 HOLLY SPRIG or HOLLY WHIRL Small Compote: The bonbon, bowl, and card tray are not difficult to locate. The small compote, deep sauce dish and the rose bowl whimsey are rare. The same shape as a Strawberry Wreath compote, fewer than half dozen of the compotes are known in amethyst and marigold. The green example shown here was not known some ten years ago. 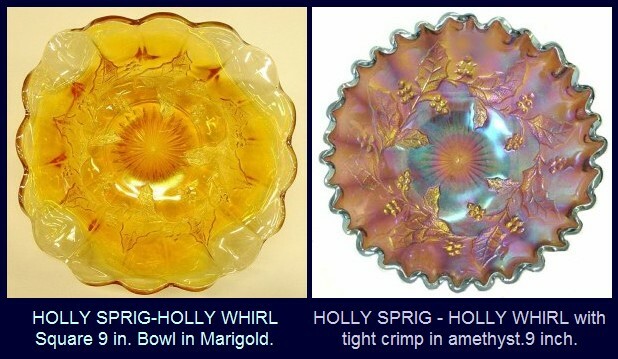 There are 10” Holly Sprig bowls having the Near Cut Wreath exterior pattern known in ruffled or ice cream shapes. This bowl is quite hard to locate. 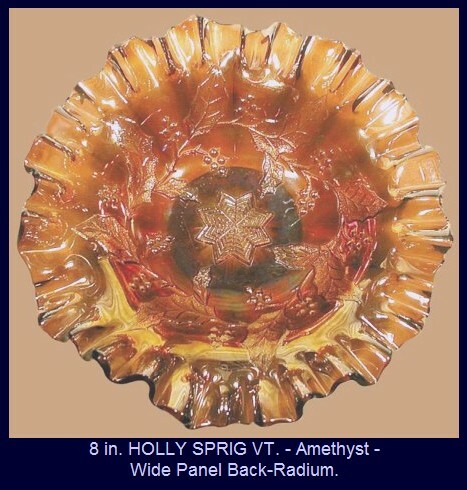 HOLLY SPRIG or HOLLY WHIRL 9” Bowls: These bowls have the Wide Panel exterior and are usually found on radium finish. Green is another color to look for. Square bowls are rarely for sale. HOLLY SPRIG or HOLLY WHIRL VT. 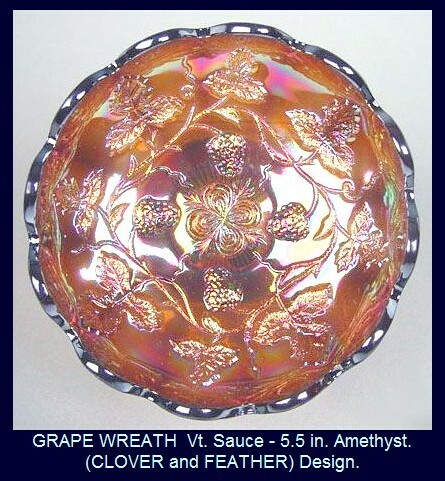 Deep Sauce Dish: This 6” sauce is rare and quite desirable in amethyst, green or marigold. There is a rosebowl whimsey in vaseline carnival. Holly patterns are usually good radium finish, although satin examples are to be found, as well. 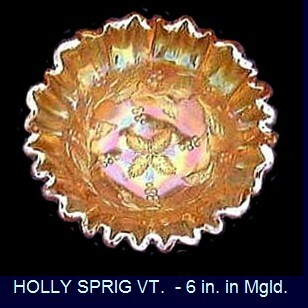 HOLLY SPRIG or HOLLY WHIRL VT. 8” Bowl: These are rarely seen. 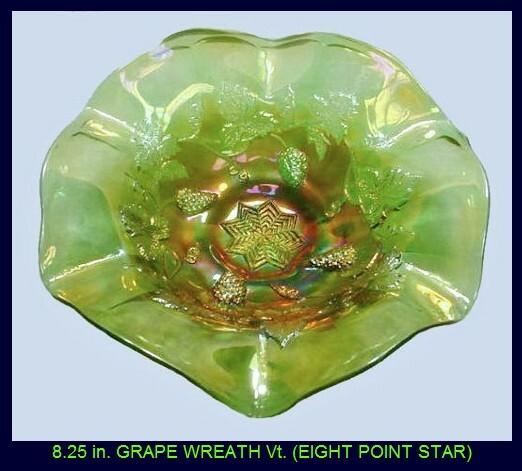 The center design is like the one seen on Grape Wreath Vt.
Marie McGee mentions having owned a green 8” Holly Sprig Vt. bowl with a multi-ringed star variation in center.